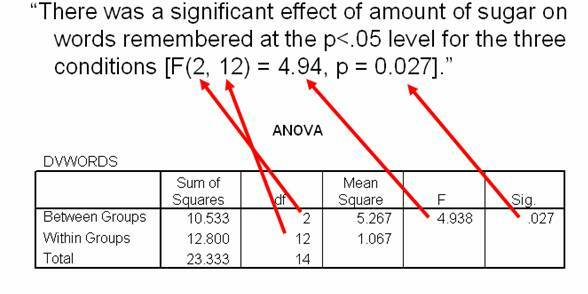 How do I report a 1-way between subjects ANOVA in APA style? Home > How do I report a 1-way between subjects ANOVA in APA style? You want to tell your reader what type of analysis you conducted. This will help your reader make sense of your results. You also want to tell your reader why this particular analysis was used. What did your analysis test for? “There was a significant (not a significant) effect of IV ____________ on DV ______________ at the p<.05 level for the three conditions [F(___, ___) = ___, p = ____]. Let’s fill in the values. You are reporting the degrees of freedom (df), the F value (F) and the Sig. value (often referred to as the p value). In the previous chapter on interpretation, you learned that the significance value generated in a 1-Way Between Subjects ANOVA doesn’t tell you everything. If you find a significant effect using this type of test, you can conclude that there is a significant difference between some of the conditions in your experiment. However, you will not know where this effect exists. The significant difference could be between any or all of the conditions in your experiment. In the previous chapter, you learned that to determine where significance exists you need to conduct a post hoc test to compare each condition with all other conditions. If you have an IV with 3 levels, like the one in this example, you would need to conduct and report the results of a post hoc test to report which conditions are significantly different from which other conditions. Because we have found a statistically significant result in this example, we needed to compute a post hoc test. We selected the Tukey post hoc test. This test is designed to compare each of our conditions to every other conditions. This test will compare the Sugar and No Sugar conditions. It will also compare the A little sugar and No Sugar conditions. It will also compare the A Little Sugar and Sugar conditions. 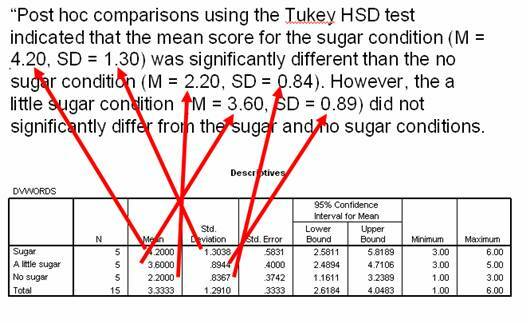 The results of the Tukey post hoc must be reported if you find a significant effect for your overall ANOVA. You can use the following template to report the results of your Tukey post hoc test. Just fill in the means and standard deviation values for each condition. They are located in your Descriptives box. If you used this template with our example, you would end up with a sentence that looks something like this. This sentence is so much easier to understand than the scientific one with all of the numbers in it. Looks pretty complicated but it is simple when you know how to write each part.